Provides accurate measurements through aerial data capture, powering stockpile management essential to mining operations. Effective stockpile management programs utilize accurate and detailed knowledge profiling each stockpile. A thorough stockpile management program allows operators to accurately and efficiently account for stockpiles and archive ore grades throughout the life of a stockpile. Traditionally, ground-based techniques and technologies are used in stockpile management programs to achieve operational efficiency, but can be time-consuming, labor-intensive and costly. Drones for stockpile management have emerged as an incredibly efficient industrial-grade tool, assisting in a wide range of stockpile management applications including blending, managing inventory and financial reporting. The simplicity, speed and agility offered by drones for stockpile management, sets them apart from conventional aircrafts and traditional data collection methods. Airobotics’ industrial-grade, automated drone system provides surveyors and mining professionals access to high-quality digital 3D models, using photogrammetry or LiDAR. For mine operators, this data plugs directly into any mining or GIS software suite for further analysis and evaluation. Airobotics automated drones can be incorporated into stockpile management programs including blending efforts by assisting in the calculation of blended piles by tracking quantity of ore grades mixed. Additionally, UAV stockpile management programs can provide value in archiving layered stockpiles by profiling historical stockpile grades and archiving ore grades across the life of the stockpile to minimize misclassification. Many mining companies are investing immense resources in technological solutions that provide greater data collection and analysis. This data has enabled companies to monitor what is happening on-site and generate insights that can improve results, cut costs and advance capital flexibility for growth opportunities. Airobotics’ concept paper, Automated Drone Applications in Mining, gives an in-depth look into various drone applications used in mining, including the direct and indirect cost benefits. 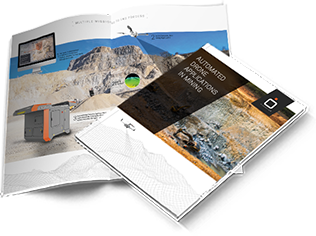 With Airobotics’ fully automated and self-operated drone platform, mining companies can receive the data they require for various functions across the mine, without the operational complexity and overhead.